Below you'll find pricing from Apple authorized resellers for Apple's 15" MacBook Pro with Touch Bar (Late 2016) family of Macs paired with one of the company's AppleCare extended warranty protection plans. Every 15" MacBook Pro comes with a one-year limited warranty and up to 90 days of complimentary telephone technical support. Purchasing an AppleCare Protection Plan alongside a new MacBook will extend that warranty for an additional two years. With it, you'll also get direct, one-stop access to Apple's telephone technical support for questions about your Mac, macOS, and Apple-branded applications such as Photos, iMovie, GarageBand, and more. In addition, youâ€™ll get 24/7 priority access to Apple experts via chat or phone, and even local repair service when you visit other countries around the world. An AppleCare extended protection plan for a 15" MacBook Pro retails for $349, but considerable discounts can be found on Macs bundled with AppleCare from authorized resellers such as Adorama and B&H. 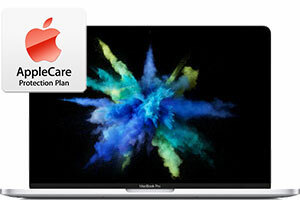 To add AppleCare to your 2016 13" MacBook Pro purchase at MacMall, begin adding the system to your cart and on the screen under "Service Plans," select AppleCare.